This house was built in 1978 without a standard foundation. The decision to move this house and then remodel was very hard to make. The first consideration was lack of a foundation under the existing pole house. This required a retrofit foundation which meant jacking up the house. 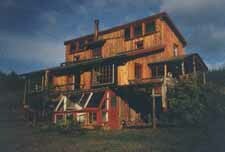 The owners also wanted the house in a different location to gain a view and more solar exposure. The additional cost of moving the house instead of adding a foundation in the original location was minimal and allowed a walkout basement to be added as part of the foundation design. 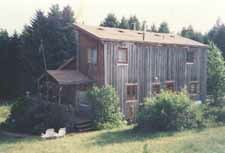 The photo on the left shows the front of the house before the house was moved and added to. To the right is the house after the additions. 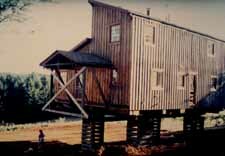 The house was moved about 500 feet up a hill. 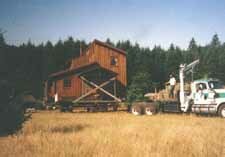 The photos below show the house being moved. Once moved the house was propped up on cribbing to allow a basement to be built under it using expanded poylestyrene blocks as the form material. This then is filled with concrete and rebar and becomes an insulated wall. 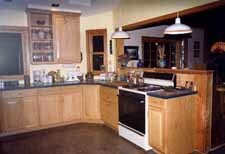 The basement was built larger than the existing structure to allow for additions. See photos below. The addition you see in the above right photo contains a new kitchen and utility room. A wrap around porch was added to give the house a farmhouse look. In the back of the house the master bedroom was bumped out and a new master bath was added. Above this bath the upstairs bath was enlarged using the dormer addition. 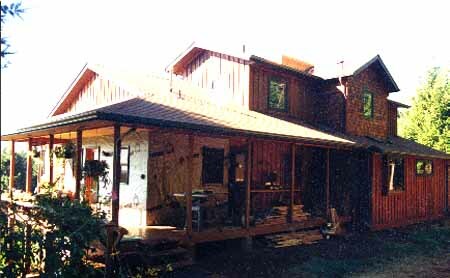 Photos of the back of the house both before and after appear at right. 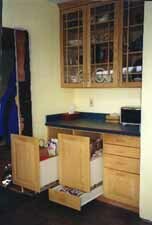 The above pictures show the interior of the new kitchen. The photo at right illustrates the custom designed recycle bins. The top rollout bin contains 3 grocery bags to sort recyclables. The drawer below fits newspapers.